We all depend on the land to live. What we do with the land — build on it, take resources from it, save it — affects the air we breathe, the food we eat and the water we drink. The land affects where we live and how we live. Even though we might walk on it every day, sometimes we forget it’s even there and can take the land for granted. How do you connect with the land? Do you play on it? Make your living from it? Explore it? Just look at it? We were looking for a fun way to get feedback from you and all kinds of different people about what land does for you. It might also encourage you to think about how important land really is to your daily life. We created this cool video contest and invite you to film and post a short (two minutes max!) video about what land does for you. Share your connection to the land with our national land conservation community. 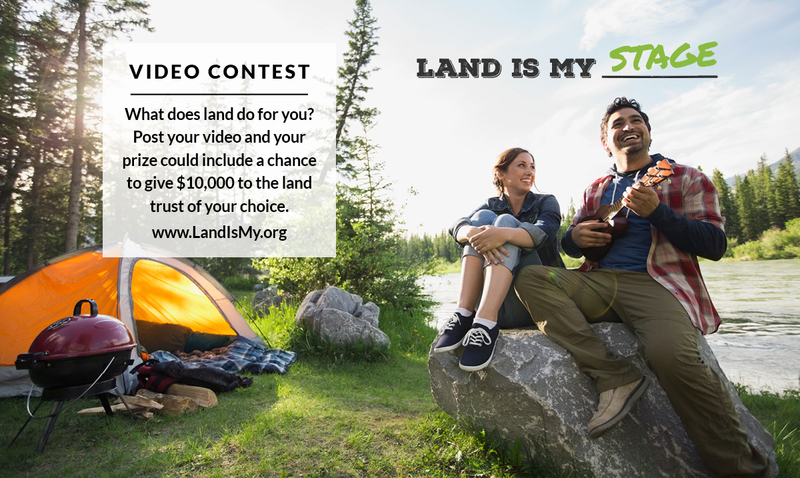 We want to hear what you do on the land and how that makes your life better. Not sure? We’re offering three cash prizes of $1,000, $2,000 and $4,000. And even better — to emphasize the role that land trusts play in making sure the land we all need is conserved for the future — the first prize winner gets to designate the land trust of their choice to receive $10,000! Here are videos to give you some ideas. We look forward to seeing how creative you and your members can be! Lights, camera, action!